Joseph Mallozzi's Weblog: December 15, 2008: Robert Carlyle Onboard, Earl Carl binder Scaramungous, and My Booziest Post Ever! December 15, 2008: Robert Carlyle Onboard, Earl Carl binder Scaramungous, and My Booziest Post Ever! Journey to the Center of the Liquor Cabinet. Round One: The butterscotch schnapps is a key ingredient in a drink called The Oatmeal Cookie, while a shot of Galliano serves to make any vanilla-based ice cream that more delectable. 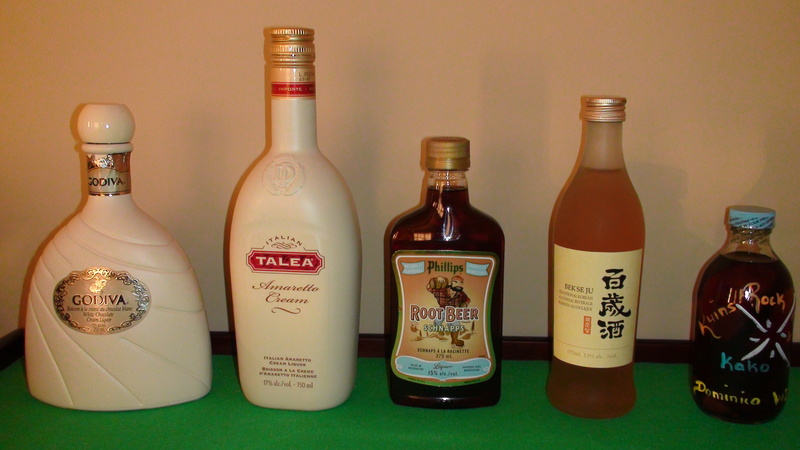 Not sure about the Mango liqueur but will vouch for the Advokaat, eggnog liqueur. The hazelnut-flavored Frangelico is as close you can get to drinking spirited nutella. The bottle on the very right - not sure what that is. Anybody? Round Two: Some sort of blueberry ice wine, a cappuccino cream liqueur, Poire Wiliams with an actual poire in the bottle, the Maple liqueur that was all the rage at our last big do, and the Limoncello lemon liqueur that my mother favors. Round Three: Creme de Cassis which is a blackcurrant liqueur, a lychee liqueur, a seemingly popular plum port, Absinthe (wasn't this stuff banned at one point?) and, of course, the staple of every liquor cabinet - the creme de banane. Round four: You got your white chocolate liqueur, your Amaretto cream and, over on the end, a hand-bottled rum Marty G.'s brother brought back from Jamaica. Beside it is a Korean liquor (haven't a clue). My favorite though is the root beer schnapps. I'm saving it for when my 8 year old nephew comes to visit! If you’d like to participate in the “Which of the following Stargate: Universe supporting characters has the potential to be the next big break-out Stargate Fan Favorite?” poll, check out yesterday’s poll for the link. Last time I checked, Riley was running away with it while poor Henry was bringing up the rear. Well, with the holidays almost upon us, it’s time to take stock of things like your finances, your relationships, and, most important of all, your liquor cabinets. Ours, for instance, was running kind of low and, with Lawren scheduled to housesit for us while we’re away in Montreal, I thought it best to top off the selection. I mean, the last thing I want is to come home from my Christmas holidays to discover all the mouthwash has been finished. And so, ever in the search for the new, the weird, and the interesting, I picked up an interesting assortment of spirits, liquors, and liquid stunners this afternoon. To be honest, I’m not much of a drinker, excluding the occasional glass of wine with dinner or odd hollowed skullful of ceremonial mead, but these purchases look so interesting that I may have to put together a special Weird Food Purchase of the Day: Liquored Up edition in which I sample a shot from each bottle. The running commentary on that one should be priceless if not inevitably incoherent. Previous Article December 14, 2008: Sleep! Glorious Sleep! And the Search for the Next Big Stargate: Fan Favorite! Thanks for the confirmation, Joe! Pfft, what’s so great about Riley, I ask you? It’s Wray all the way (see, it even rhymes)! That’s it, I’m starting an Anti-Riley thread on Gateworld! And, uh, a pro-Wray thread! Yes! Well, this news of Robert Carlyle has certainly peaked the interest of fandom. Even at Gateworld, it seems that there is an overwhelmingly positive mood regarding this news. Even those who’ve decided to hate/disregard this series have decided to watch the pilot! Question: Will Doctor David Rush die in the pilot? I very much doubt you’ll answer this, but it couldn’t hurt to ask. Oh, and Narelle, it’s great that you’ve decided to stay at Joe’s blog! Don’t let the whiners get you down; there will always be those like me who will make fun of them, for you. Also, das…I’ll just assume that you stopped talking after the “wise, young man” bit. Hours of amusement in that Bond Baddie site! Is it just me or do all the female phrases sound like Claudia Black? Your alcohol cabinet looks like my parent’s cabinet when we were growing up. Then you get to that age when you think it would be really cool to mix a bit of each one into a glass and drink it through a straw. **shudder** A lesson learnt in just one shot, well many shots, but only one attempt. You’re missing the Pimm’s! Where’s the Pimm’s?! PS: I will make a donation to the charity of your choice to see you do a WFPOTD on that selection above. I think the one on the right may be sake. I saw a bottle just like it yesterday. (Not in my liquor cabinet, by the way. 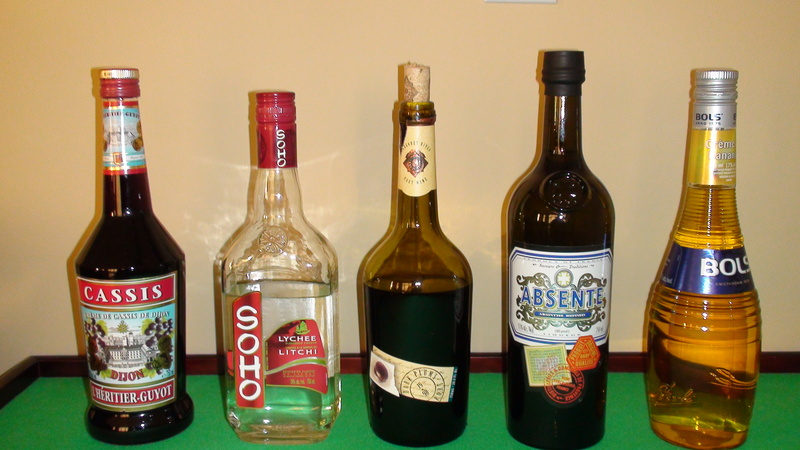 And, yes, absinthe was banned, but is making quite a comeback as of late. It just can’t be pure grain alcohol flavored with wormwood anymore. Off to make a Bond baddy. I love Robert! He was great in the newest 24. I think he’ll be a unique addition, not similar to the other main characters we’ve had on SGA and SG1. I vote yes on that Weird Food Purchase segment! Though, it probably should be over a few days. And yes, absinthe was banned. It was only recently I found out it wasn’t. Apparently, the French really do enjoy it. It was the drink a friend of mine ordered every time he went to the bar. I myself am not a big fan of liquors, but the maple sounds interesting. I’m also amused by the bottle that looks like an Aunt Jemimah syrup bottle. Robert Carlyle on SGU. Thats great news. Now i’m waiting for the second known actor for Colonel Everett Young. one question: is he main cast or recurring? Also, thanks to the kind comments from people. It’s really sweet. @ Narelle: I caved when Joe announced the name of the first SGU episode. I feel it is my duty to create all Episode Pre-Airing Discussion threads, because I’m obsessive and compulsive like that. 1. Will Carlyle be keeping his natural accent for the show? 2. Will Universe in general see more alien life forms then the other two shows? Any chance of more puppet style aliens along the lines of Thor, or Farscapes Rygel? 3. You wrote previously that Carl Binder would be producer while the other writers including you would only write the occasional script but be less involved. Is that still the case or will Gero, you and the others all be producing and involved full time? 4. Will the show contain a plot device which allows people on alien worlds to be human? I am terribly amused by the phrases. That might also be because GW mods are also deleting negative posts… The Carlyle news is being greeted with mixed reception; some love the actor and others are “who?” Time will tell! but, quick question. Saw somewhere (can’t recall) but someone said SGU was a two-year show. I can’t recall seeing it anywhere. Is there a specific timeframe for the show, or just go long as it can last? Twas taking a look at Robert’s past in film, and noticed that he is Scottish. Will his character reflect this? If so, woohoo, another Scottish character! Robert Carlyle did an amazing job this year in 24: Redemption, his performance was absolutely amazing. I’m sure he’ll do a great job in Stargate: Universe. You folks made a great choice! Thanks as always, and cool liquor collection there! You’re missing chocolate wine from your “must have” list. Though thanks for reminding me that I need to update my own stockpile. The fact that I have maybe 2 alcoholic drinks a year, not including wine, means I woefully neglet this aspect of my post-apocolyptic stockpile of trading goods. The announcement of Mr. Carlyle coming on board is … interesting. It’s certainly a hopeful development. I just wish I could work up the excited anticipation that I felt when Atlantis was due to premiere. Ah well. So, the doggies are doomed to being boarded while you head eastward for the holidays, or are you boarding up a person to care for them instead? Amazing what questions come to mind after a long sleepless night. Oh, and thanks for the Bond website. Are you getting these sites from other people, or are you really becoming that obssessed with playing online? Haha, that Bond thing’s great! Lookit, it’s Martin Gero’s evil twin! King Oreg nitram Oddjobbie! General Destructo Strombernefield! I guess the Baron got a new title. Ok, let’s try that second link again! fsmn36– Hehehehe, someone else that remembers Pimm’s Number 1 Cup. I blame my Gran, she loved it. This may sound a little morbid, but when my Gran was in her final hours my cousin and I turned a shot of Pimm’s into a custardy goo so she could have something other than morphine. She hadn’t spoken in 3 days, but when that Pimm’s hit her lips her eyes shot open and we got a “Mmmm nice” from her. It was the last thing she said and a priceless moment! It’s freely available here so an online seller might be able to help you. Joe – Want me to go away again? PG15 – Joe’s evil twin. Separated at birth. Hey! Still waiting on a current cast list with descriptions for SGU! Else I’m going to have to vote for Riley in the poll, based entirely on the criteria of A) I like how the name sounds and B) See A. If you’ve got Rush AND Young in SGU, by the way, I’m more hopeful about the series. Variety in ages is a good thing. Unless you’re planning on killing Young off early, ya buggers! That’s a great moment! A little humor for you all and probably a great relief to have a familiar taste for her at the end. WOW Robert Carlyle!! Excellent !! He will really add to the show. Am looking forward to it even more.. Any idea when the show will air? Quite a selection of spirits. @PG15 – And I was so fond of you! I’m wounded. Those aren’t snowflakes floating down the page – they’re my crystalline tears of pain! Dear god, Joe – I’d pay good money to see that WFPOTD! Well, I’d pay Australian Dollars … perhaps not quite so enticing. 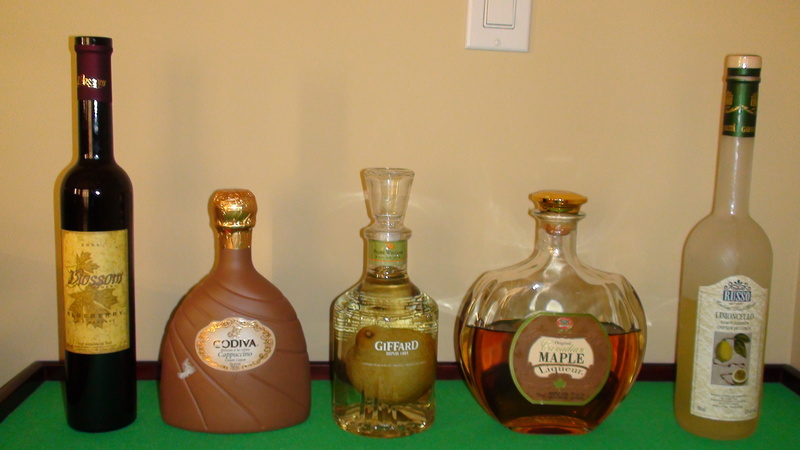 That’s a very pretty liqueur collection you have – I do love the attention paid to the design of booze bottles. Hi Joe, at last my stint as a host Mum to a kid from the other side of the world is over. Now I only have a Dad and a boarder to not worry over. 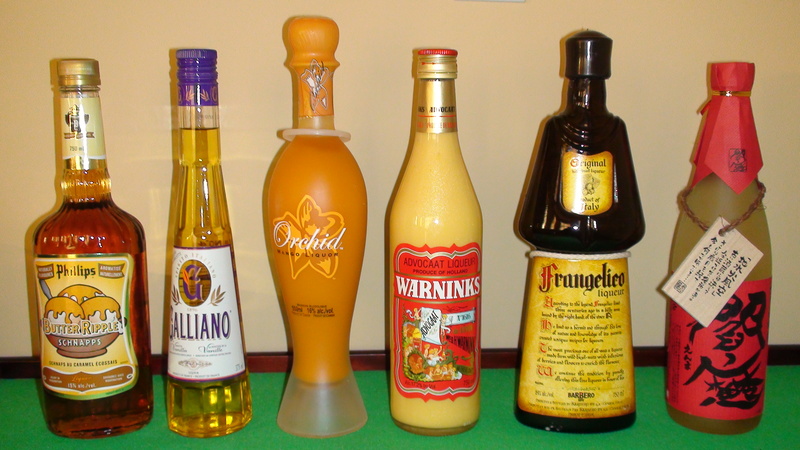 I dont see any Bailey’s in your liqueur cabinet – great for pouring over vanilla icecream and poach pears!! Not that Nutella or Ameretto are good, but the mmmm creaaaaaammmy Bailey’s!! A joy to savour. Mint flavoured is just smashing!! What an odd coincidence. I’m just in the middle of watching a movie that he’s in. He’s one of those guys who always seems to crop up randomly in movies I’m watching for other reasons, so I’ve seen him in a lot, though I never paid attention to his name. He’s good, though. Should be very interesting to see him on SGU. Oh, do please tell us he’ll use his natural accent, though. In my opinion, one can never have too much Britishness in a show. I also happen to think the Glaswegian accent is the hottest accent ever in the history of ever. Those pics kinda make me wish I wasn’t completely disgusted by the taste of alcohol. The others I’ve seen here are just hilarious! Great choice on Robert Carlyle! Although the article I read said he was cast as the lead, I think your statement that he is not the lead is likely more accurate. I can’t wait to see who you folks cast next! Thanks for the update! Ps.. Hey Shirt’n’Tie… what does your baddie look like??? Hummmm!